License: Free up to $0.05/$0.10 and $39.99 up to $0.25/$0.50. Full version is $59.99. Optional Insta-Scan is $14.99 per month up to $0.25/$0.50, $19.99 per month for all stakes, and $129.99 per year for all stakes. Holdem Manager has a few add-ons at an extra cost, one of which is Table Scanner 2. 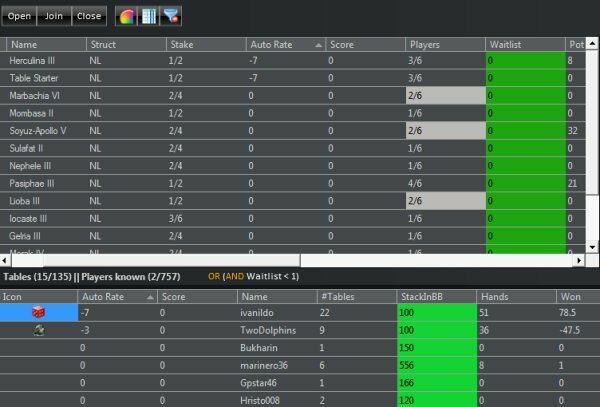 This powerful tool scans the lobby of your favorite online poker site and reports detailed table and player statistics, which are referenced from your own Holdem Manager database. This allows you to select tables like never before and find the juiciest ones in a matter of seconds. The one thing that many full-time online poker players practice regularly is great table selection. Nobody wants to play on a table full of sharks when there are action-packed tables full of fish waiting for them. When the goal is to make as much money as possible, playing against the worst possible competition can mean big bucks added to your win-rate. The problem for many players is that while shuffling tons of tables, it can be difficult to find the juiciest ones to join. That's where Holdem Manager 2's add-on feature Table Scanner 2 saves the day. There are settings for how you want to view the Table Scanner, how often you want scans to occur, and speed settings, just to name a few. This is also where you can decide to use the optional add-on called Insta-Scan. When using Insta-Scan, Table Scanner 2 will use server-based information on tables, increasing your speed by up to 7,250%. We recommend checking out the client-side scan before upgrading to Insta-Scan since the speed is generally fast for these types of scans as well. One of the most powerful features of Table Scanner 2 is the ability to add a filter so that you can make the report sift through sites to show only what you want it to. Filters include setting a specific range for the number of players, number of people on a waitlist, number of short-stackers, average VPIP, number of regulars, and more than a dozen other criteria. Multiple filters can be saved and run individually or in conjunction with others. There are tons of helpful features to help you find the right table, some of which you would not have even thought to add yourself. The software takes advantage of your pre-established auto-rate rules in Holdem Manager 2 to quickly identify the fishiest players tracked in your database. You can also manually add fish to your list so if there is someone you always want to play against, you can find him quickly even if his search feature is off in the poker client. For those who hate having too many short-stackers at their table, there is even the ability to set a helpful alert for this as well. 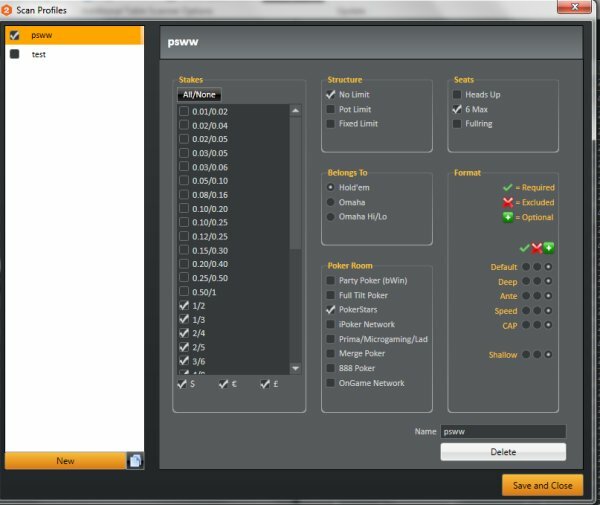 Table Scanner 2 brings order from the chaos of an online poker site's lobby and makes a science out of table selection. With table selection tools as efficient as this, it doesn't make sense for you to continue to do things manually. For the price, it seems like a worthwhile addition to Holdem Manager 2 and one that can really improve your win-rate.